But there was also this idea, this desperate hope, or was it a conspiracy theory, that Kanye's irrational behavior over the last few weeks — the MAGA-hat selfie, the suggestion that slavery was a choice — might be some sophisticated bait-and-switch that would expose these deeper truths about the times we're living in. Maybe we were all a little too hopeful. Or maybe that My Beautiful Dark Twisted Fantasy season of the Dissect podcast really had us sold on Kanye's genius. More on that word in a sec. Kanye West made his eighth studio album his first self-titled LP — not counting the messiah-complex of a portmanteau he created with Yeezus. At seven songs, ye is his briefest artistic statement, his shortest fuse. It's even stylized in all lower-case letters. It's pronounced like the exclamation "yay," but maybe it's more of an unconscious cry for help. We've been talking about Kanye living in this bubble, with the reality-star wife and the Calabasas address, and this album sounds like Kanye trying to bring us into his bubble. Or transmit an SOS distress signal from deep within. Even the extravagant listening event, in the middle of the least likely spot in America to release a hip-hop album, Jackson Hole, Wyo., felt like an attempt to bring 100+ music writers and taste makers and radio folks to the same isolated void he exists in on some level. He alludes to having bipolar disorder and calls it his "superpower," which is interesting to think about in this era where we're finally starting to examine problematic genius. Jayson Greene of Pitchfork has this really great Kanye essay in which he talks about how gendered the word "genius" is because we reserve it only for men who symbolize this idea of "patriarchal conquest." On the same album that Kanye says he's praying for Russell Simmons because he "got #MeToo'd," he rhymes sincerely about the challenge he knows he has in store raising daughters in a world full of hypermasculine, aggressive men because he's one, too. The contradictions have always been rich with Kanye. At his best, he's seemed to purposely play with them to reveal his and our humanity. I'm not sure how self-aware he is here. Very self-absorbed, though. Ann Powers: Laughing/crying emoji. Fire emoji. Heart emoji. Praying hands emoji. That's what Kim Kardashian tweeted after riding with her husband to the ranch called Diamond Cross, where he was about to reveal the work upon which their reputations and possibly, fortunes, would rest, at least for the next foreseeable future. Above the symbols, she added a picture of the sublime Wyoming mountains with a scrawl defacing it, and this: "Kanye shot the album cover on his iPhone on the way to the album listening party." The scrawl, which Kanye finger-painted on in the green of the phone's palette, reads: "I hate being Bi-Polar it's awesome." No wonder his wife chose symbols adding up to confusion, with an end note of distress, to share its origin with the world. Anyone who is or has a loved one dealing with bipolar disorder knows the seed of radical disquietude the condition plants in anyone who encounters it. Mania makes you a superhero; the crash on its other side goes so low you scare yourself. The worst thing about bipolar is that, under its spell, the kind of rush that unaffected people actively seek — the zing of fun, the flash of insight, the surge of a healthy ego — becomes an entryway to chaos. To look at your husband smiling, dancing, and wonder if he's put away his meds and is going to stay up for days now, signals a lack of control no amount of wealth or celebrity can ameliorate. To be that person making great work that's always about to tip into incomprehensibility (take your meds) makes every year a shaky one. I'm conjecturing here about the private lives of the Kardashian Wests, and what intimate experiences lay behind this very short album that, in its ability to haunt, almost feels like too much. But there's no doubt that mental illness is a major subject of ye, to my ears its central focus, not only spoken through the lyrics but in the seductive sound collages that billow below them like an aural portrait of the subconscious. Ye immediately took me to my bookshelf and the questions raised by Kay Redfield Jamison in her crucial memoir of bipolar living, An Unquiet Mind. "Which of my feelings are real?" she asks. "Which of the me's is me? The wild, impulsive, chaotic, energetic, and crazy one? Or the shy, withdrawn, desperate, suicidal, doomed, and tired one?" Kanye seems to be asking these questions too, by telling stories from each of those perspectives, laying them out in a line like contradictory emoji's on a screen. Rodney Carmichael: Listening to the album's first song, "I Thought About Killing You," makes me think Chris Rock, who introduced the album to the assembled tastemakers who were in Jackson Hole for the ye listening party last night, is right: Kanye West really might be the most free black man in America ("No black man has taken more advantage of his freedom than Kanye West," Rock said.) Ye obviously believes it to be true, which is probably more dangerous for the rest of us black men than him. But the question is who is Ye talking to in that monologue? The other side of his bipolar self? Us? Kim? Is he having a real OJ moment? I'm not making light here. I think it's a worthy question even beyond the intro track. Is this his idea of free thought? Who does he imagine his audience to be? Ann Powers: Rodney, in a recent conversation you pointed out Kanye's gift for incorporating popular music's newest elements on every project, in ways that make it seem like he is their originator. Here he's doing that, too, and reaching into his own catalog: Depression and mania have long been among the genre's fundamental concerns, especially in regards to how black men cope with those conditions (or don't) as they also face unrelenting grief from the outside world. He's connecting with the the emo mood of Logic, Lil Uzi Vert and XXXTentacion — and, like that last troubled figure in particular, asserting becoming vulnerable in this way does not make you any less prone to bad behavior. Here is an album about not the stories behind inner torment, but the experience of it, including those brief respites when it recedes and ordinary life feels graspable. In those moments, Kanye still grasps for women: "I could have a Naomi Campbell, and still might want me a Stormy Daniels," he drawls over a pumping missionary-position beat in "All Mine." It's the mandate for toxic masculinity: You're falling apart, that little voice says, but you can still dominate. This album fights against the feeling of privilege crumbling. Tupac and Biggie, rap's unparalleled self-analysands, are the patron saints of Ye; the warmth of its darkness reminds me of the Geto Boys' "Mind Playing Tricks on Me." The first time I heard it, not looking at the live stream where people were dancing but just closing my eyes, I also thought about others who tried to describe the experience of mental unrest: the Brian Wilson of Smile, with his pet sounds pinging through his brain; the Alex Chilton of Big Star's third album, his anger and his vulnerability wrestling on the rec room floor. This is an album that starts with the calm confession — possibly directed at Kanye's inner self — "I thought about killing you," reaches an emotional climax with one of the strangest images of freedom I can recall, sung by 070 Shake: a kid putting her hand on a hot stove to see if she can still feel something. I feel sad listening to this album. And, like Kim, I feel that fire. Rodney Carmichael: America's been driving black folk to the brink for 400 years. It's a collective demise hidden behind all the invisibility of structural and systemic barriers at play nowadays. But now and then an individual rises to the top that reminds us of all the BS we're still wading in. This album is part suicide note, part ransom note. And it's gonna take more than a forged doctor's prescription to fix Ye. Consider the irony behind a man who questions the trauma of slavery while clearly suffering from his own version of post-traumatic slave syndrome. Have you ever noticed that all of Kanye's heroes are white men: Jobs, Musk, Trump. When he raps "I don't take advice from people less successful than me" on "No Mistakes," that excludes an entire legacy of black generational wealth — not the green kind but the red kind — the blood that's kept us vital and alive in this country for centuries despite being born targets. The freedom Ye is exercising ain't free. It sounds like he's forgotten that. But the soundtrack to the sunken place sure sounds seductive. From the abbreviated tracklist, I got tricked into thinking this would be Kanye's minimalist album. But sonically, it bears more in common with the maxed-out vision of My Beautiful Dark Twisted Fantasy. That album found Kanye using featured vocalists like stackable instruments on songs like the opulent "All Of The Lights." He seems to spread that approach across this extended play that benefits from the contributions of 070 Shake, Kid Cudi, Ty Dolla $ign, Charlie Wilson, Jeremih, John Legend, Valee and Dej Loaf. It's a symphony of moving parts and their contributions add a richness to the album that goes beyond sonic color. This is Kanye's roving Greek chorus, a multitude of voices echoing his angst, his pain, his confusion and tragic isolation. Ann Powers: I love that phrase "a symphony of moving parts." Of course, any orchestral work includes that mechanical aspect: individual players aiming for the synced precision of a machine, or a hive mind. But in most symphonies, the parts mostly become masked within the surge of the whole. Listening to My Beautiful Dark Twisted Fantasy today, I'm swept up in the surge, the prismatic whole Kanye's hard beats, choral samples and snippets of string sections make. 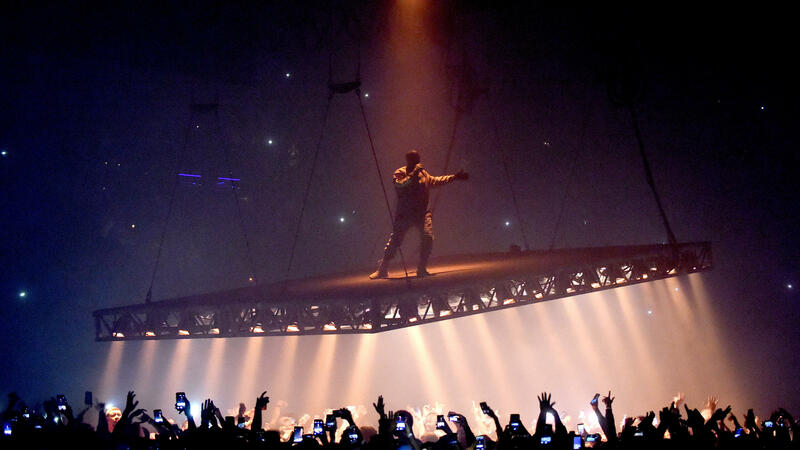 The Life of Pablo also produced that feeling of wholeness, through the communal power of the gospel music it both relied upon musically and tapped for thematic inspiration — though Kanye's own words there often slapped down its striving for transcendence with deliberate crudity. Ye reminds more of Yeezus, though Kanye has put aside the weaponry of the electro dance floor in favor of the soul and obscure pop sampling of his earlier works. (Notables include the floating choruses of Kenyan band Black Savage on "Yikes" — a perfect sonic companion to drug-induced paranoia — and the lilting voice of the great Slick Rick on "No Mistakes.") I don't quite have the analysis worked out on this early listen, but what I'm noticing is the difference between those albums in which Kanye builds a monument and those in which he inhabits a .... Shelter? Tank? Prison? The many voices of ye shore each other up, as you say, Rodney; in songs like "Ghost Town," whether they're sampled or emanating from friends in the studio, they complete — or fracture — each other's sentences. To invoke another dazzling, disturbing and possibly morally suspect pop culture phenomenon, the central character Kanye builds from these voices reminds me of the anti-hero David Haller on Legion, a mutant whose schizophrenia does sometimes manifest as a superpower, and at other times mortally endangers himself, his loved ones, the world. Aubrey Plaza, another of Legion's stars, has called the series "a post-truth comic book show." Is ye a post-truth album? As you've inferred, Rodney, Kanye unsatisfactorily addresses his recent, devastating offhand comment that "slavery was a choice" on "Wouldn't Leave"; instead of elaborating (hey, maybe that's a blessing, I don't really want to hear his rationalizations), the rapper simply applauds himself for being a "wild" thinker with more wackadoodle poopity-scoop underneath the iceberg whose tip that deeply offensive falsehood represents. He then praises Kim for not abandoning him, though she was horrified by this incident — not on moral grounds, but because she anticipated it would damage their mutual brand. David Haller's love interest in Legion, the disastrously empathetic Syd, knows that he may destroy the world, but chooses personal loyalty over the communal good. On ye Kanye presents himself as an equally dangerous companion to Kim — is she the focus of the murderous thoughts he voices at the album's start, or is it himself, or is his dark fantasy here murder-suicide? "Wouldn't Leave" ends with Ty Dolla $ign tenderly praising women for sticking with the dudes they're stuck with, even when faced with unfaithfulness or worse. The bar this album sets for men's behavior is exceptionally low; infidelity, drug use and general self-delusion are all acceptable, if they're rationalized with a little tenderness. And yet — as a producer, Kanye still overcomes his worst tendencies. Though Kid Cudi's turn is notable, the best features on this album belong to women, and they speak as if from within the dormant side of Ye's consciousness, where tenderness actually survives. By featuring two of the most intriguing young women rappers out there — 070 Shake and Dej Loaf, both of whom have released powerful verses about depression and their attempts to heal themselves — Kanye finds a way to, if only momentarily, escape his own monomania and remember that sometimes actual truth can come from the patient cultivation of insight. In "Ghost Town," it's 070 Shake who offers that disturbing image of freedom found by a child through self-inflicted pain, pointing toward the epidemic of self-harm among young women today. Dej Loaf's verses in "Violent Crimes," though compassionate, also address the risks young girls face at the hands of damaged and damaging men. That last song shows Kanye reaching out to his young daughters in love, but ultimately getting distracted by the idea that other men might hurt them. He acknowledges that his own attitudes may challenge them, too, though he chalks that up to "karma," not something he can actually control. In the end, a woman's voice is the one that proves protective — the last vocal on ye is a voicemail recording of Nicki Minaj, taking credit for the "Violent Crimes" line about North West: "Imma turn her into a monster, but no menages." It's a tricky moment, given Kanye's history with recorded conversations in which women acquiesce to his will (the old Taylor can't come to the phone right now.) But I'm choosing to read it as hopeful: Someone is going to take care of these kids, and protect them from toxic men, including the kind their father still chooses to embody in his music. Rodney Carmichael: This really is a genius read, Ann. Much more genius than I feel Kanye's intention is behind this work. (And I say that in a conscious attempt to strip the g-word of its gendered application.) It's too early to tell how we'll feel about this album in a week, month, year. But a lot of people — former fans — have cancelled Ye for good reason. Your analysis here is a reminder that it's better to grapple honestly with works we're conflicted about and tortured by than to ignore them altogether. It might be our only shot at attaining any sort of redemption or communal healing from the open wound exposed by Kanye's glorious mess.